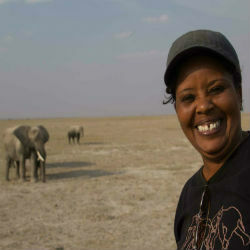 Norah Njiraini has dedicated her life to elephants. In 1985, she was the first research assistant recruited to the Amboseli Trust for Elephants and is now also training co-ordinator, having developed a training programme for observers of all abilities. The Born Free-supported Amboseli Elephant Research Project, based in Kenya, is the longest running study of wild African elephants in the world. Research from the project has provided valuable insights into the behaviour and intelligence of African elephants that can inform the conservation of this species. 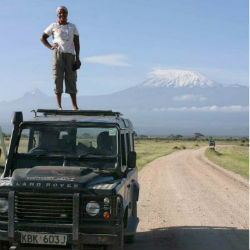 Norah grew up in Loitokitok and visited Amboseli from a very young age. Her first role at the Amboseli Trust for Elephants was to study Amboseli’s male elephants, which means that her knowledge of Amboseli’s bulls is now encyclopaedic and legendary! 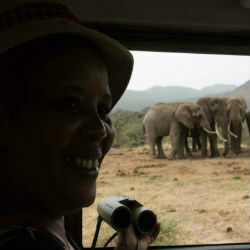 Her motivation continues to be the elephants that she has monitored with such dedication for the past 33 years. As training co-ordinator, she knows just how important it is to inspire the next generation to preserve and protect all forms of wildlife – especially elephants. It’s no surprise, therefore, that Norah’s vision for wildlife 20 years from now is to “manage to attract young talent and attention so that by that time there will be a new generation of heroes, passionate about wildlife”. Norah is a wildlife hero, but her own wildlife hero is Dr Cynthia Moss, the celebrated Programme Director and Trustee of the Amboseli Trust for Elephants who has researched elephants in Amboseli since 1973.